The Storage Equipment Manufacturer Association (SEMA) has launched a new group for distributor members, the SEMA Distributor Group (SDG).Members of the SDG will be known as SEMA Distributor Companies and are entitled to display the SDC logo on promotional materials and vehicles. The group already comprises more than 20 members some of whom were previously SHEDA members. Over many years, SHEDA enjoyed increasingly strong links with SEMA and both associations recognised the benefits of unity. SHEDA has now ceased to be a formal entity. David Camm, chairman of the SEMA Distributor Group, said: "We anticipate that many more companies will see real value in applying for SEMA's Distributor Group status. However, our joining criteria are strict and commitment to a random audit will be a deterrent to some. There will be continuity as practically every single former member of SHEDA has chosen to opt for a SEMA Distributor Group membership." SEMA Distributor Companies will supply products that are recognised as fit for purpose and all works will be carried out by installers that can be individually certified through SEIRS. SEMA Distributor Companies must commit to best practice in health & safety, and installations, the SEIRS training programme and the SDG member charter. SDG members benefit from SEMA brand status and have a voice on SEMA Council, committees and working groups including SEIRS. The SEMA Distributor Group has laid out rigorous criteria for membership. An SDC business must have been formally constituted as a legal company for at least two years. It must hold a main distributorship from a recognised manufacturer of storage equipment and an appropriate health and safety policy must be in place. There is an undertaking to conform to SEMA Codes of Practice, standards and safety initiatives including SEIRS where the SDC also undertakes installation work.Where installation is carried out as part of the company's activities there must be at least one SEIRS Supervisor on board. Permanent Installation staff must hold full SEIRS ID Cards. Critically, SDG members must conform to a random audit. A SEMAappointed auditor will study a recent completion and review all documentation including quotation, design, submission, installer details, methods and sign off. 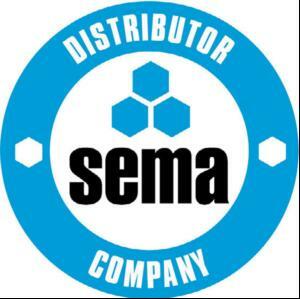 SDCs may only use the SEMA Distributor Company logo in association with new, original equipment supplied. They must demonstrate DQAS Compliance (the SEMA Distributor Quality Assurance Scheme). Cost of annual membership for 2011/12 is £1400. John Halliday, president of SEMA, said: "Today's announcement strengthens the relationship between well designed storage solutions from SEMA manufacturers and the SEMA distributor companies who supply and install them."